Tendonitis in the foot is a common problem especially when you use your feet profusely such as in playing sports. 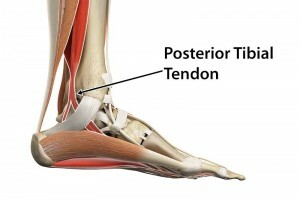 One of the most frequently affected tendons is the posterior tibial tendon, a structure that is normally hard at work, throughout the contact phase of gait (when the foot is in contact with the ground). The posterior tibial tendon runs behind the inside bump on the ankle, across the instep, and attaches to the bottom of the foot. It is held in place by thick fibrous tissues which form a lever behind the ankle bone. This lever creates tremendous force, effectively slowing the foot down when the heel strikes the ground. The symptoms of posterior tibial tendon dysfunction include pain in the instep area of the foot and swelling along the course of the tendon. The patient may also experience pain and swelling right behind the inner ankle bone. There is also pain when the area is touched along the course of the posterior tibial tendon behind the inner ankle. There may also be burning, shooting, tingling, stabbing sensation because the main nerve is inflamed along the inside of the ankle. The patient will experience pain when exercising or even just walking, steadily worsening toward the end of the day. In severe cases, pain can be easily felt when the patient slightly moves his/her foot, during passive stretching of the posterior tibial tendon, and on eversion or flattening of the foot. In some situations, the tendon may actually rupture or tear due to weakening and inflammation.